They used to carry fencing equipment on the same points years ago, on 180's, 185's and Beavers and airdrop them, IIRC. Doubt if the designer has airdropping of bikes in mind. 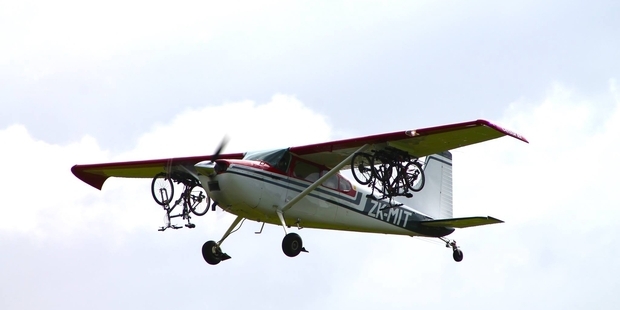 Mr Brereton, who worked as a mineral exploration pilot before buying the company, believes his plane is the only one in the world that carries bikes on the outside. Don't you believe it. 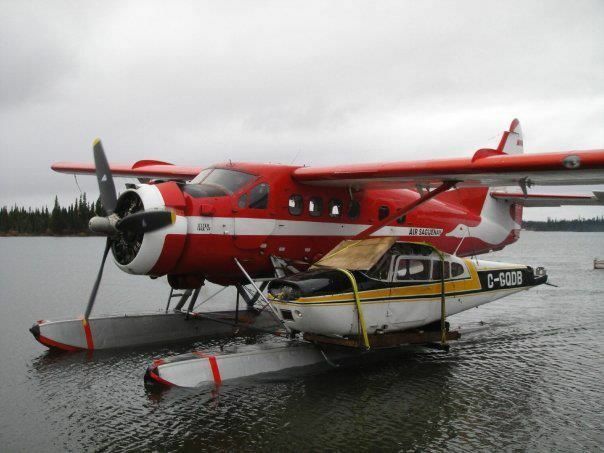 Bush pilots will lash anything to their floats - it's inconceivable that none of them has ever tried it with a bicycle. I'll take your word for it Gertrude. There is a picture somewhere of a 185 with Gnat hanging under one wing and a small drum on the other side to balance things! We carry 185's around as spares. If it has a R-1340, you need a spare! Or is it a PZL conversion. That's the PZL conversion with the DC-3 prop. I think I'm in love, Mr Pigboat. I would willingly sacrifice body parts for one of those. My Grandad and an RN observer regularly strapped their bikes to the wing struts of a Swordfish when they went on posting or exercise. Sir Niall Dementia: my Dad was a trainee FAA O/N and spent some time on Swordfish at Worthy Down, with a certain Laurence Olivier as his pilot. Dad occasionally talked about going on flights to other bases, with bicycles, small motorcycles and/or friends lashed to the undercarriage! Some fascinating stories which I was able to record before his memory went, great to hear your memory of this sort of thing! We had a Valiant crew chief who would stash his bicycle in the upper fuselage between the fuel tanks. Winging our way across the Indian Ocean we drivers suddenly realised that the ailerons had gone to fingertip control, any appreciable movement would induce unheard of rates of roll. Not wishing to twist the wings off we carried on to Butterworth leaving them to the autopilot and on finals disconnected the powered controls and landed it in manual. Investigation in the fuselage where the feel cans were then revealed that the bicycle had fallen over and jammed the control spigot of the airleron Q feel therebye removing all feel from the ailerons. 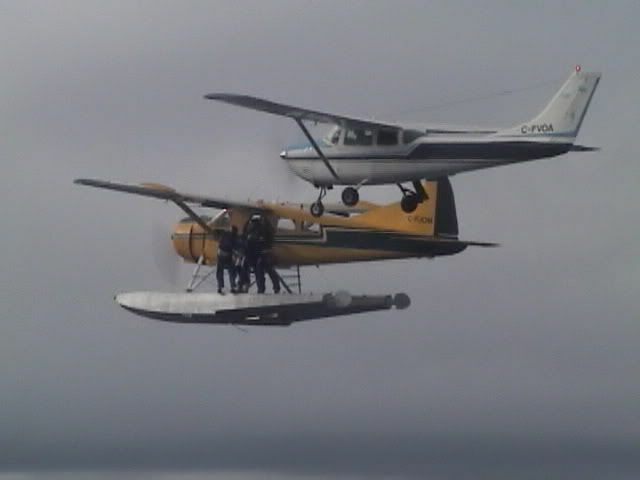 If an EASA FOI saw that nice big float plane attempting that on a EASA registration, they would stroke out on the spot! ! So what's the aerodynamic drag coefficient of a couple of Malvern Stars?? Got to be worth several kts in cruise speed ability, I'll wager! Pigboat - Shouldn't you have a 185 under each wing for proper balance? What's the yaw level like, with just one?? Indeed, bicycles are very draggy. They should be in a pod, ideally. The Canadian authorities would probably do the same. One must present them with a fait accompli. Rusty that is supposed to be the best engine/propeller combination for the PZL conversion. I have never flown one. Apparently the yaw wasn't at all bad with that load and the airplane chugged along a 90 knots. It was discussed briefly on another board. Then there are those who forget the keys to the shop. Same engine as the AN2? If so it's a thirsty beast, consuming around 200 litres per hour. The AN 2s I'm aware of didn't need warming up. The engine tolerances were too wide. There's a limit on the oil temp for taking a big handful of power, but nothing we need to worry about in most of Africa.